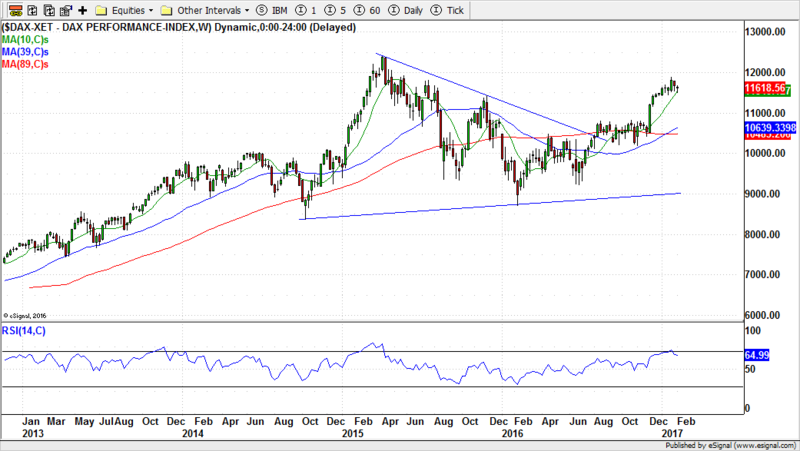 German XETRA DAX broke above a symmetrical triangle on weekly timeframe in early August 2016, by rising above 10500.00 (Chart 1). From August to November 2016 it stayed within a horizontal trading range with an upper limit of 10830.00 and a lower limit of 10170.00. In early December it broke above that trading range. The 100% extension target of the horizontal channel is near 11500.00, which the index reached by the end of 2016. The 161.8% Fibonacci extension target is near 11900.00, which it reached by January end. The height of the symmetrical triangle is nearly 4000 points. The break point is near 10450.00. This gives us a 61.8% Fibonacci extension target near 12950.00, and the 100% extension target near 14500.00. The start of the triangle was in October 2014 and the break was in early August 2016, or nearly 20 months later. This tells us that the projected target may be reached between August 2017 and March 2018. DAX reached an al time high of 12390.75 in April 2015, which may act as a resistance on the way to these targets. Only time will tell whether the index will overcome this resistance in a timely fashion. 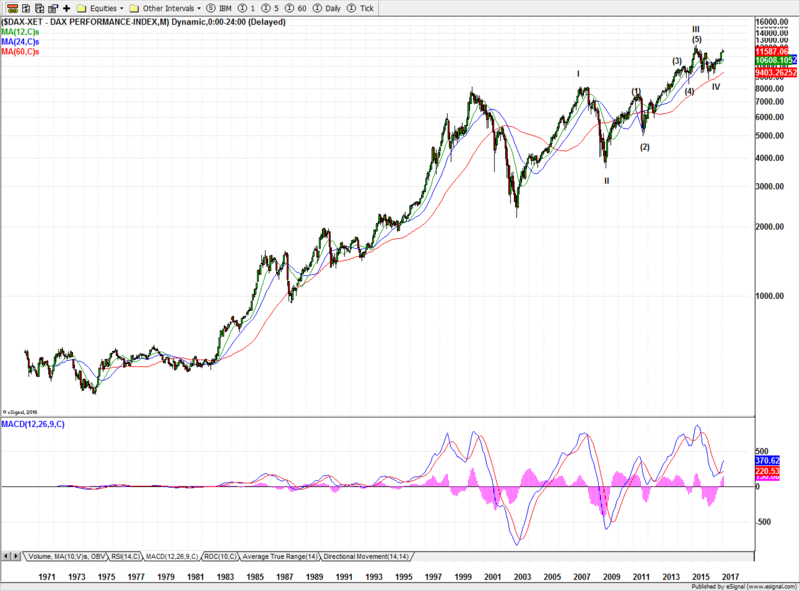 On the monthly chart of DAX, an Elliott Wave structure is quite visible (Chart 2 – Log Scale). We mark the start of current Elliott Wave cycle, consisting of eight waves in two distinct phases, from the lows of March 2003, when the 3-wave corrective phase (zig-zag) of previous cycle ended. We did not identify that Elliott Wave cycle, which probably started in ’70s with its 5-wave motive phase (impulse). The wave I of the current motive phase ended in July 2007. The countertrend wave II ended in March 2009. The next directional wave, wave III, was an extended wave and consisted of an Elliott Wave cycle of lower degree. The motive phase of the lower degree cycle ended in April 2015, which was also the end of the wave III of the higher degree cycle. The wave 1 of the lower degree cycle ended in May 2011, wave 2 in September 2011, wave 3 in June 2014, wave 4 in October 2014 and the wave 5 in April 2015. The corrective phase of the lower degree cycle ended in February 2016, marking the end of wave IV of the higher degree cycle. We are now in the wave V of the higher degree Elliott Wave cycle. In their seminal book, Elliott Wave Principle, Robert R. Prechter Jr. and A. J. Frost provide some basic techniques to estimate the wave length. In the current cycle, the third wave is an extended wave. In such cases, the fifth wave is, usually, either equal or 61.8% of the first wave. The height or length of wave I is 5962.82, form a low of 2188.75 in March 2003 to a high of 8151.57 in July 2007. The wave IV ended at 8699.29, the low February 2016. The 61.8% extension of wave I is near 12384.31, which is near the April 2015 high. The 100% extension of wave I will give us a target near 14662.11, which is near the symmetrical triangle target (Chart 1). There is no reliable way to project the time duration. Wave I lasted nearly 52 months. Wave IV ended in February 2016. A 61.8% extension of wave I duration gives a target date in October 2018 and 100% extension gives us a target in June 2020. On weekly chart, the FTSE 100 index of U.K., completed an inverse head-&-shoulder pattern (Chart 3) in June 2016 in the aftermath of Brexit referendum. The height of the pattern is approximately 988 points. The break of the neck line, which is slanted, was near 6334.63. The 100% extension the pattern gives us a target near 7323.01, which the index achieved in early January. The 161.8% extension of the pattern gives us a target near 7933.83, which is more than 10% away from the current levels. On monthly chart, the Elliott Wave pattern on the FTSE-100 index of U.K is not as clear (Chart 4 – Log Scale). However, the index made a symmetrical triangle over may years. The upper line is formed by the highs reached in December 1999 and July 2007. The lower limit is bounded by lows of March 2003 and March 2009. The index first tried to break above the upper bound in May 2013. The break faltered in April 2015 at the resistance zone near 6950.00 created by the high reached in 1999. After dipping below the upper bound the index broke above it in July 2016 and made all time high in January 2017. The height of the patterns is approximately 3673 points and the break point is near 6504.oo. The 61.8% extension target is near 8774.31, which is nearly 22% away from current levels. The CA-40 Index of France declined from April 2015 to February 2016. It then rallied and made uneven double bottom (Chart 5). It broke above the double bottom patterns in December 2016. The height of the pattern is approximately 651 points and the break out is near 4607.69. The 100% extension target of the pattern is near 5259.40, which is also close to the resistance created by April 2015 high. The index also formed a symmetrical triangle, which it is trying to break above. The height of the pattern is almost 1494 points and the break out point is 4769.84. The 100% extension target of the pattern is near 6264.44, which is close to the high created by July 2007 high. 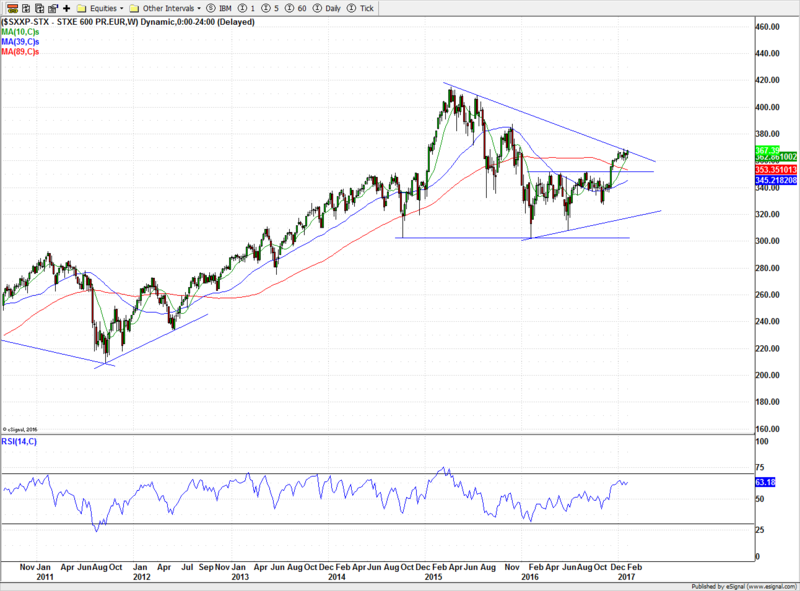 On monthly timeframe, the index is forming a symmetrical triangle (Chart 6 – Log Scale). The upper limit is bounded by highs of September 2000 and July 2000. The lower limit is bounded by the lows of March 2003 and March 2009. 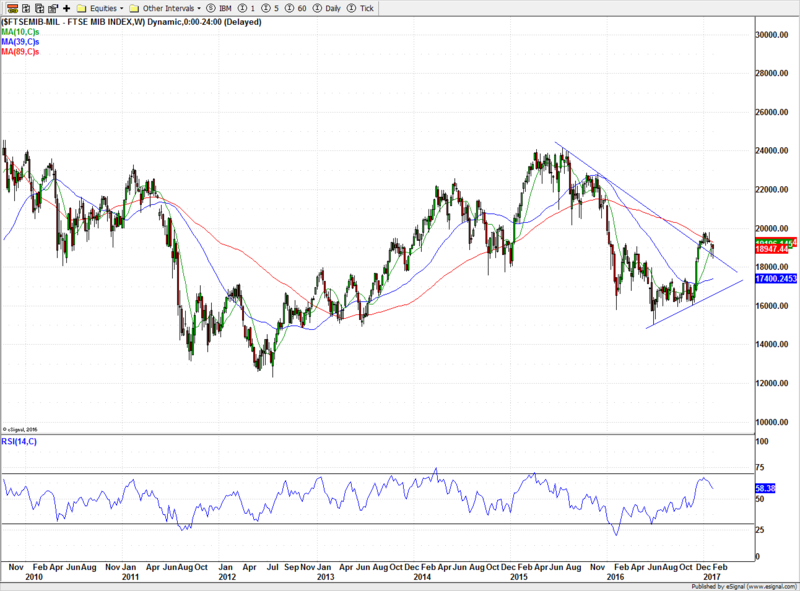 The IBEX 35 index of Spain bounced off in June 2016 near the resistance created by June 2013 lows (Chart 7). In April 2016, it had turned down at the resistance level created by the low of December 2013. The price action of the index from early January 2016 to early December 2016 created a horizontal channel, which it broke above in mid-December. The 100% extension target of the pattern is near 10930.80, which is slightly above the resistance created by November 2015 high. The 161.8% extension target of pattern is near 11966.26, which is in the resistance zone created by the high of April 2015 and January 2010. 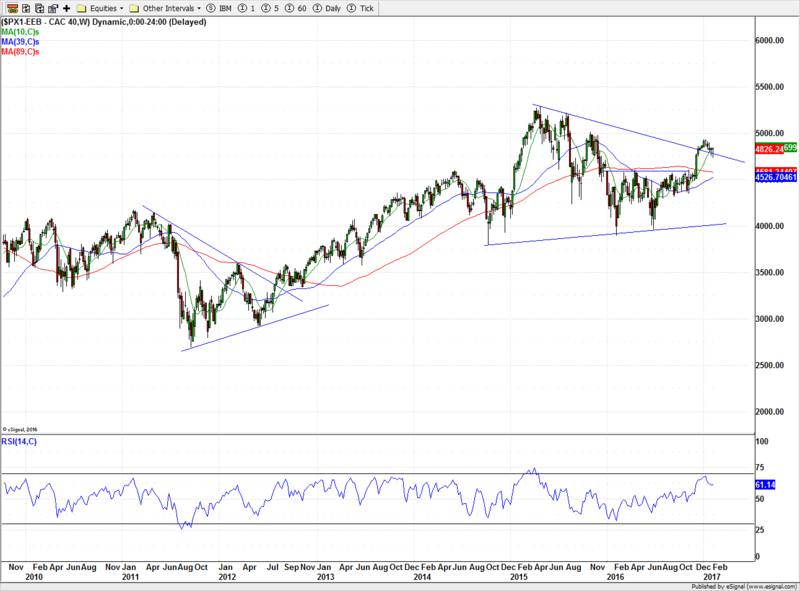 On monthly chart, the index is forming a symmetrical triangle (Chart 8 – Log Scale). 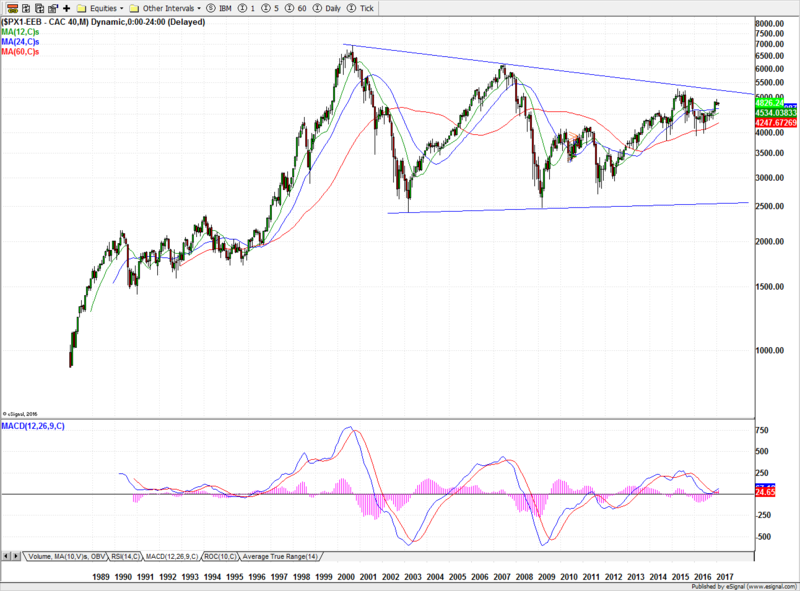 Italy’s FTSE MIB is in a downtrend on monthly timeframe for a long time. It has been making lower highs and lower lows (Chart 9 – Log Scale). 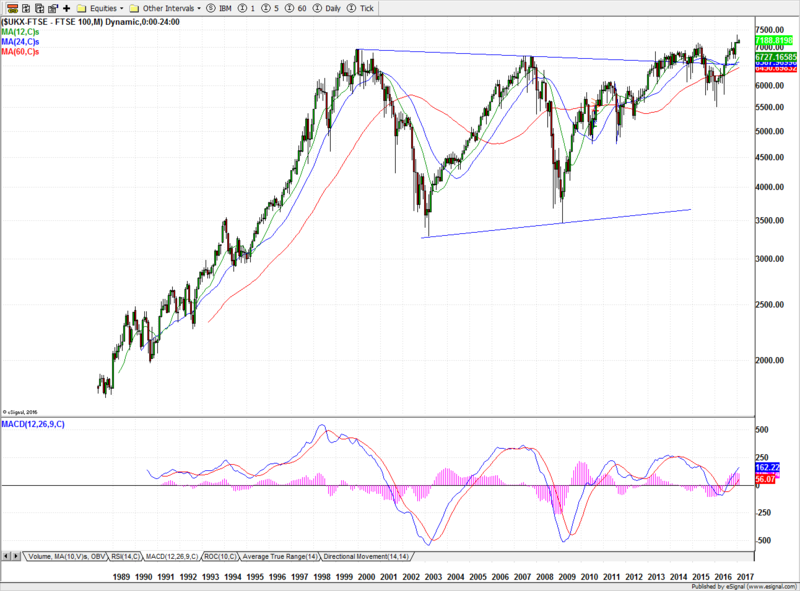 Since October 2008 the index has formed a horizontal channel. The upper limit is near 24157 and is bounded by the highs of October 2009 and July 2015. 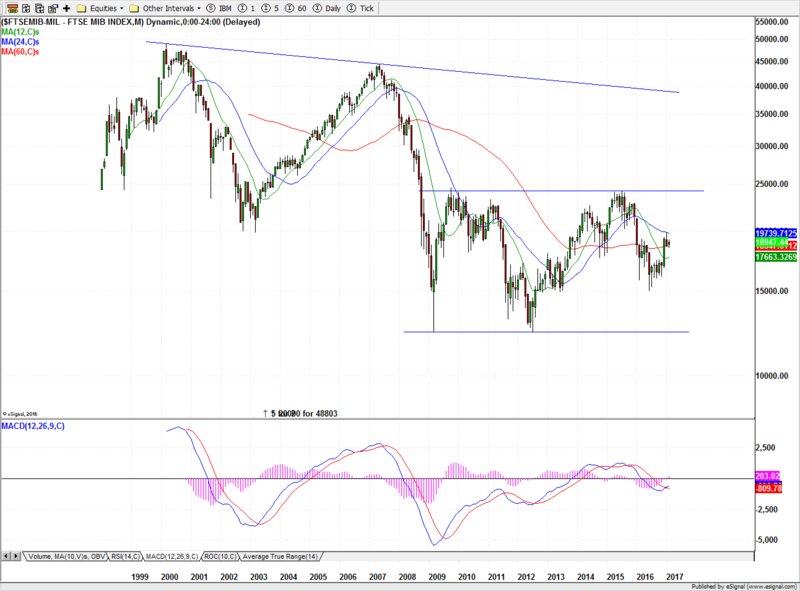 It made all time low of 12332.00 in March 2009 and then tested it again in July 2012. At the moment it is in the middle of the channel. The upper limit is nearly 27.5% away from the last close of 18947.44. On Weekly timeframe (Chart 10), the index broke above a downtrend line, that is forming since July 2015, in mid-December 2016. It is also near resistance level of 201158. The next resistance level is near 22844.64, which is almost 21% away from current levels. 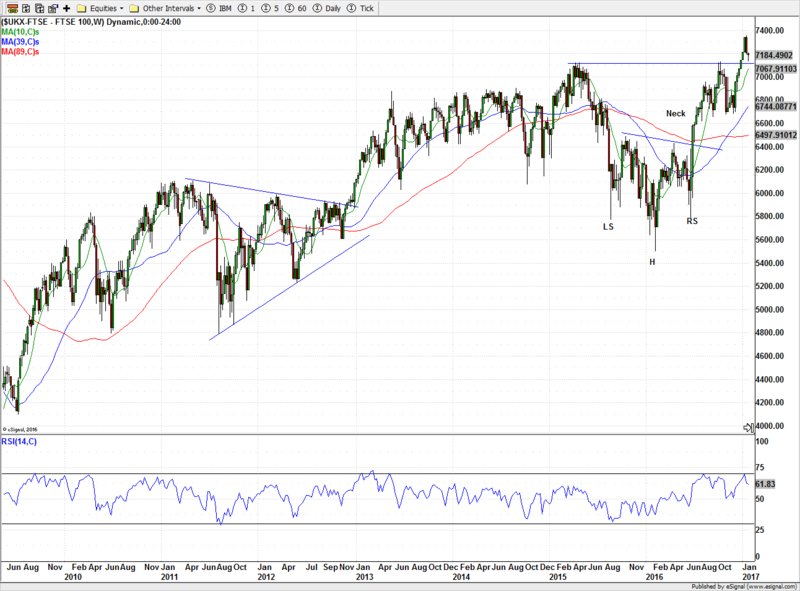 The Swiss Market Index (SMI), the benchmark index of Switzerland made a double top in August 2015 (Chart 11 – Log Scale). 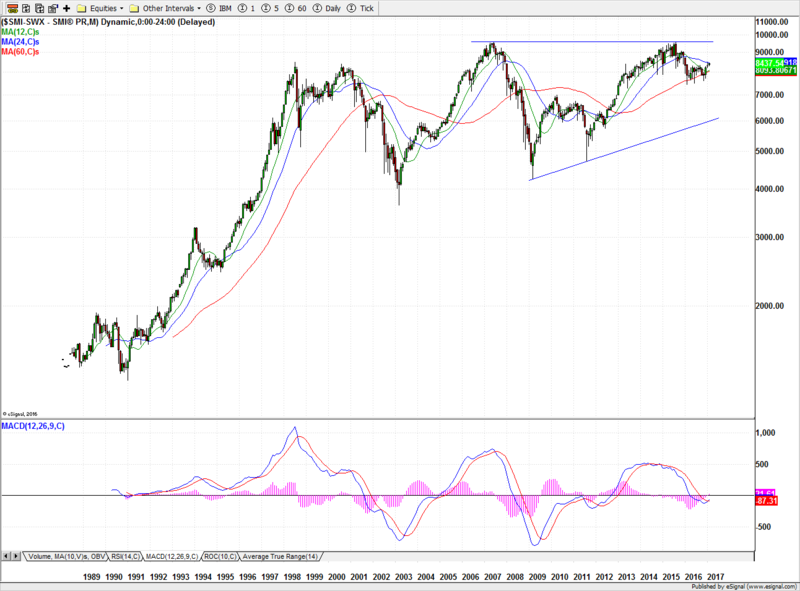 On monthly timeframe the index is carving out an ascending triangle. After a brief decline the index is again moving toward the top, which is 13% away from the last close of 8437.54. 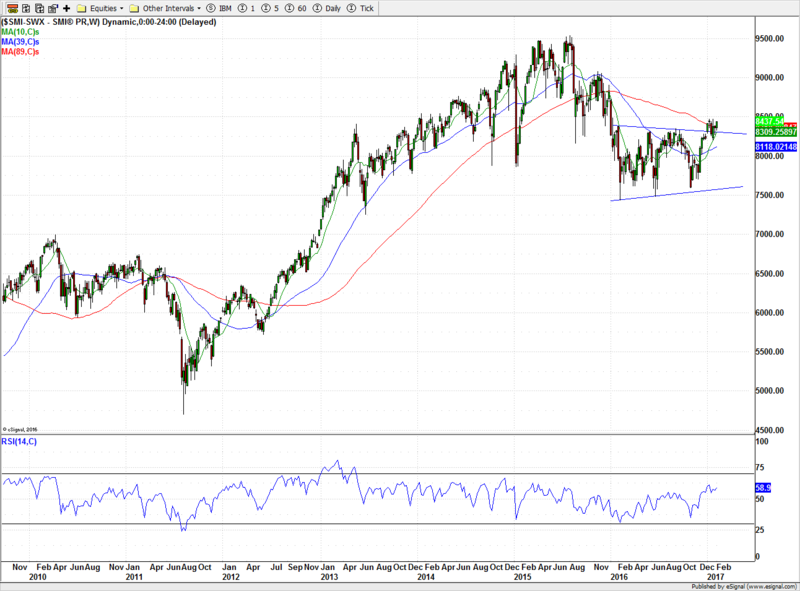 On weekly timeframe, SMI formed a symmetrical triangle. It broke above the upper limit of the pattern in early January 2017. It then tested the limit before bouncing off again. The height of the pattern is 956.08 and the break out point is 8283.60. The 100% extension target of the pattern is near 9239.68, which is just above the resistance of 9080.56 created by the high of November 2015. The 161.8% extension target of the pattern is near 9811.75, which is above the all time high of 9537.90. STOXX 600 is the benchmark index consisting of 600 large European companies. It bottomed in March 2003 and then made a high in July 2007 (Chart 13 – Log Scale). In March 2009, in the aftermath of global financial crisis it briefly breached 2003 low. It then made all time high in April 2015. 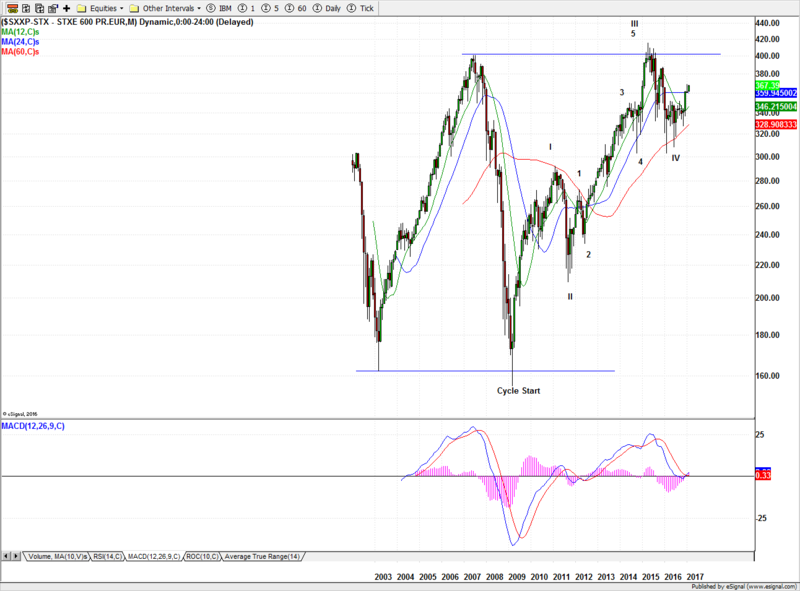 The monthly timeframe is showing an Elliott Wave cycle. The start of the cycle was in March 2009 (Chart 13). The wave I ended in February 2011. The countertrend wave II ended in September 2011. The wave III was an extended wave and included an Elliott Wave cycle of lower order. The motive phase of the lower order cycle ended in April 2015, which also marked the end of wave III of higher order cycle. The corrective phase of lower order cycle ended in November 2016, which also marked the end of wave IV of higher order cycle. We are now in the wave V. Using the technique used for DAX (Chart 2), there is a high probability that the fifth wave will be either equal to or 61.8% of the first wave. The length of first wave was 135.78 points and the start of fifth wave is 327.02. Thus the projected level of fifth wave is between 410.93 and 462.80, which are 12% and 26% away from last close of 367.39. 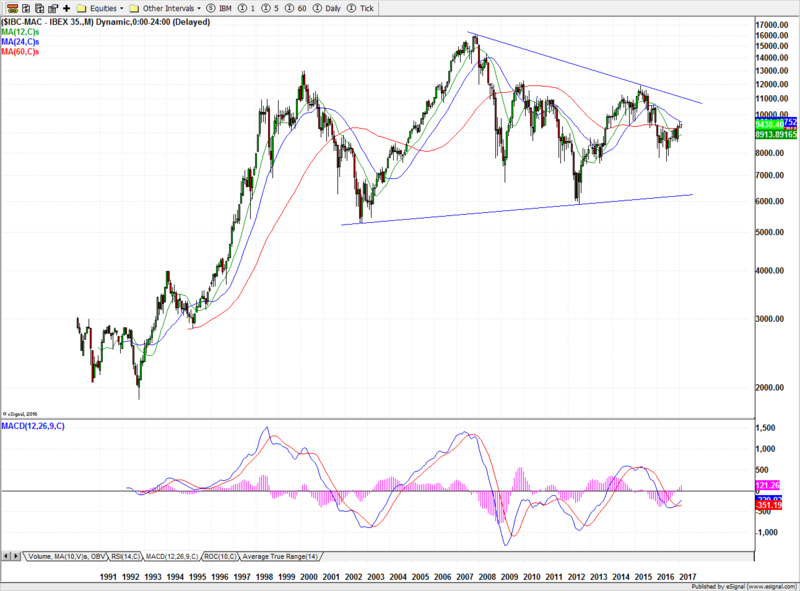 On weekly timeframe, STOXX 600 is knocking on the upper bound of a descending triangle (Chart 14). In the week of October 13 2014, the index staged a bullish reversal after making a low of 302.48. It then made all time high of 415.18 during the week of April 13 2015. After declining in the summer of 2015, it tried to rally, but failed at 408.73 during the week of July 20 2015. Then the index declined along with other European stocks till February when it made a double bottom during the week of February 8 2016 by reaching a low of 302.59. These four levels form the boundaries of a descending triangle. 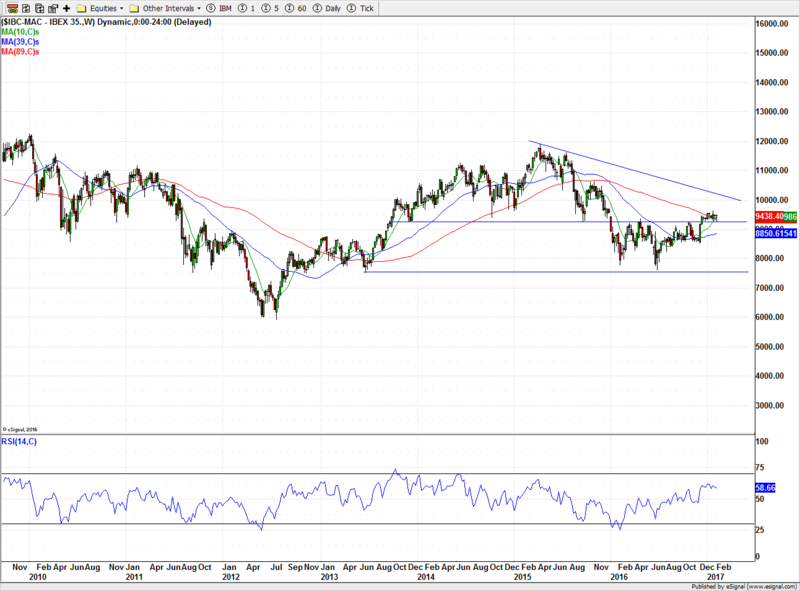 Since January 23, STOXX 600 is knocking at the downtrend line from the April 2015 high. Within the descending triangle, the index completed an ascending triangle in early December 2016. The height of the triangle is 48.92 and the breakout is at 315.51. The 100% extension target of the pattern is near 400 and the 161.8% extension target is near 430.66. S&P 500 is performing better than Germany, based upon market ETFs. 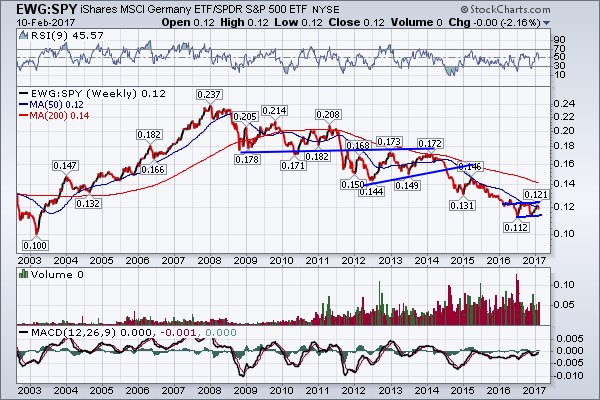 The ratio of EWG, iShares MSCI Germany ETF, and SPY, SPDR S&P 500, has been in a down trend since early 2008 (Chart 15). The ratio broke to the down side from two consolidating patterns – once in 2011 and then in 2015. It is again forming a range pattern, which means that the two ETFs are quite balanced in performance. Since November, EWG is slightly outperforming SPY. 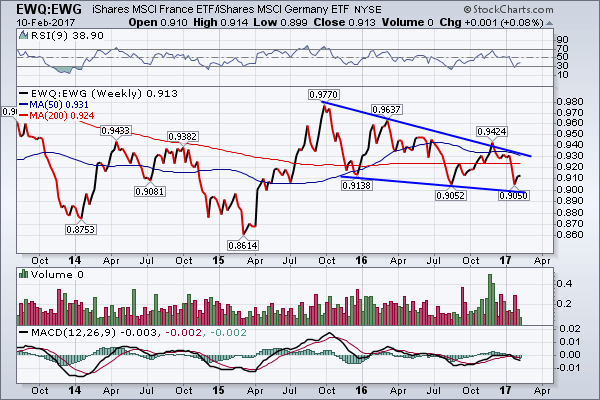 German stock market is performing better than French. stock market The ratio of iShares MSCI ETFs of Germany and France is sloping down in a narrowing band since October 2015 (Chart 16). This means that during this time, Germany, EWG, has generally produced better result than France, EWQ. 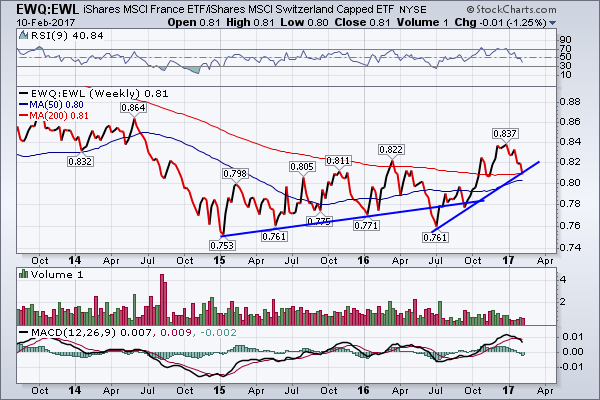 The iShares MSCI France, EWQ, mostly outperformed iShares MSCI Switzerland, EWL, from July 2016 to end December (Chart 17). Since the start of 2017, iShares MSCI Switzerland has done better. But the up trend line in progress since July 2016 is very close to being breached. In June 2016, the uptrend line from January 2015 was broken to the down side but the trend was not reversed and the ratio again recaptured the uptrend line. The iShares MSCI Switzerland has been generally doing better than iShares MSCI Spain since July 205. The ratio of EWL and EWP has mostly trended up during this time (Chart 18). The uptrend line broke in early October 2016 but the ratio has not yet established the down trend. iShares MSCI Italy ETF, EWI, is arguably the worst performing ETF. 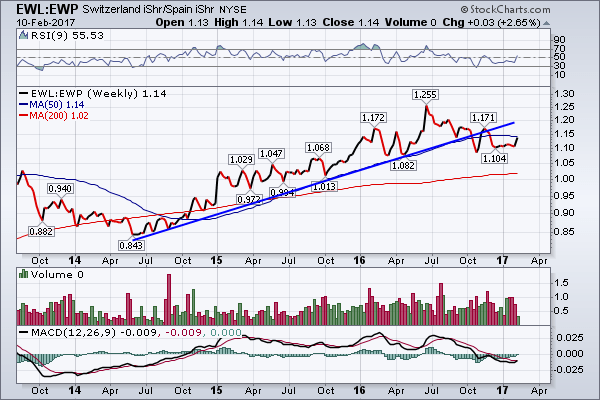 The ratio EWP:EWI was in an uptrend from October 2015 to November 2016 (Chart 19). The ratio then reversed and EWI outperformed EWP till December. 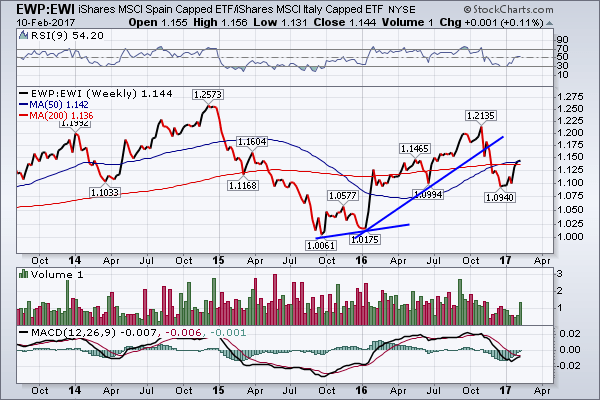 Since then the Spanish ETF has again taken the lead.